Nothing better in the fall than coming home to a nice stew that’s been cooking all day. Put all in 5 quart slow cooker and cook low for 8 to 10 hours. Add salt and pepper if you need to when you serve. Place wafers in the bottom of pie plate and set aside. Beat cream cheese and yogurt until smooth. Add sweetener and vanilla extract and continue mixing. Sprinkle gelatin in mixture and continue beating. Fold in whipped topping. Pour over Nilla Wafers and chill for at least 2 hours. Yield: 6 servings. Per serving= 199 Calories; 9g Fat (43.3% calories from fat); 7g Protein; 20g Carbohydrate; 0g Dietary Fiber; 22mg Cholesterol; 336mg Sodium. Preheat oven to 375 degrees. In a large bowl, mix Bisquick, cornmeal, and Splenda. Add cream-style corn, egg whites, and yogurt. Fold in sausage, green chilies and jalapenos. Evenly distribute batter among 20 lined or sprayed cups. 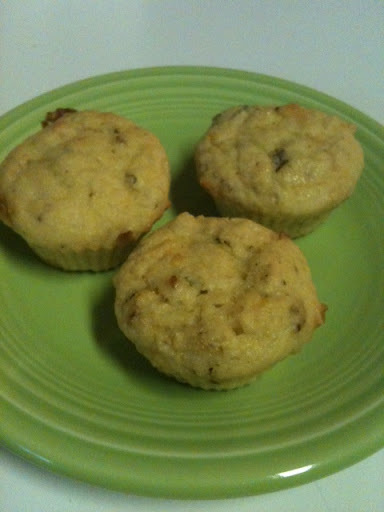 Bake until a toothpick inserted into the center of a muffin comes out clean, about 20 minutes. Yield: 20 muffins. Per muffin= 87 Calories; 2g Fat (25.2% calories from fat); 3g Protein; 13g Carbohydrate; 1g Dietary Fiber; 5mg Cholesterol; 221mg Sodium. A nice light cookie. These spread out a lot while baking so space them apart and use about 1 tablespoon of batter for each cookie. Preheat oven to 350*. Combine all ingredients. Place by the tablespoonful onto a cookie sheet sprayed with cooking spray. Bake 12-15 minutes or until lightly browned. Yield: 32 cookies. Per cookie= 64 Calories; 1g Fat (11.1% calories from fat); 1g Protein; 13g Carbohydrate; trace Dietary Fiber; 0mg Cholesterol; 111mg Sodium. This is a good dip with a little kick. Combine cream cheese, onion powder, bacon, chipotle pepper and paprika. Sprinkle with green onions and refrigerate at least one hour. Yield: 8 servings. Per serving= 78 Calories; 6g Fat (67.1% calories from fat); 4g Protein; 3g Carbohydrate; trace Dietary Fiber; 17mg Cholesterol; 197mg Sodium. Preheat oven to 350*. Combine all ingredients in medium bowl. Pour into a Bundt pan sprayed with cooking spray. Bake at 350 deg for 50-60 minutes. Cool in pan for 10 minutes, then invert to serving plate. Could also make a glaze to drizzle over cake. I’ve been reading Everything by Mary DeMuth and I keep being amazed at the number of quality books promoting a relationship with Jesus. And I don’t mean, “oh here’s just another book about Jesus.” I mean I really believe God is speaking through several people right now and we should all listen. Mary’s book describes how we seem to want a comfortable life, but what God wants for us is that crazy love relationship with Jesus where we give him our everything and he is OUR everything. We leave the comfortable life and follow hard after Jesus. But wait, Crazy Love–yeah, that’s a book by Francis Chan. Also talking about being so in love with Jesus you live your life for him. But wait, there’s more! I started reading Jeff Goins’ book Wrecked while waiting for an oil change. Right away I was hooked as Jeff describes how we want to sit on our couches and wonder why life seems to be missing something, when what we should be doing is getting out of our comfort zones and reaching out to others. It’s an example of of our crazy love for our Everything. I don’t think it’s an accident these books were written and released so near each other. I often find repetive nudges like these when God is speaking. But I don’t think he’s just speaking to me. What could we do this week to stretch beyond our comfort zones?